Digital health innovators and start-ups are invited to pitch their disruptive ideas and prototypes to NHS digital leaders and leading healthtech investors at the new Digital Health Rewired event next March. The Rewired Pitchfest, delivered on 26 March as part of the Rewired Exhibition and Conference, will provide a unique opportunity for innovators from across health and care to pitch their start-up to current leaders, and make connections that can accelerate the development and adoption of their ideas. Applications for the Rewired Pitchfest are now open, with 16 places available for the founders of start-ups and young businesses working to transform an aspect of health and care, to gain valuable exposure in front of an expert judging panel made up of digital health experts and investors. Sixteen finalists, split into four groups, will have three minutes each to pitch their concept and then answer judges’ questions on a dedicated stage in front of an audience that will include many members of the Digital Health CCIO, Health CIO, CNIO networks – the UK’s largest community of NHS IT leaders. One winner will be selected from each group to go through to the final group of pitches at the end of the morning with an overall winner selected by the judges. Judge and co-founder of Blenheim Chalcot, Manoj Badale, said: “With the ever-increasing strain on our health system, there has never been a greater need for digital platforms to transform service delivery. Fellow judge and CEO of the Digital Health and Care Alliance, Charles Lowe, added: “The Digital Health & Care Alliance is dedicated to promotion of great digital health so I am hugely looking forward to judging this exciting event to hear about the best new digital health propositions”. Digital Health Rewired is the new two-day event taking place on 25-26 March 2019 at London Olympia focused on connecting NHS IT leaders to innovation and exploring the impact of disruptive digital technologies in healthcare. The Pitchfest forms part of a packed programme at Rewired that already includes a strong line-up of digital health start-ups such as Babylon Health, Dr Doctor and Medopad. Packed with with keynote speakers at the cutting edge of the digital revolution, the Rewired Expo on day two features five dedicated zones and theatres on key disruptive technology areas – AI and Analytics; Clinical Software; Cloud and Mobile; Cyber Security; and Digital Imaging – with each having a dedicated programme exploring benefits achieved and the lessons learned. Rewired comes at a time of real opportunity for digital health start-ups that might have previously been frustrated with being able to access decision-makers and influencers within the NHS. Health Secretary Matt Hancock, Rewired keynote speaker, has enthused about unlocking innovations that can impact on clinical outcomes and efficiency improvements and vowed to “empower the country’s best innovators — inside and outside the NHS” as part of his tech vision. Start-ups, developers and innovators also have the opportunity to take part in the Rewired Hack Day which provides the opportunity for people with different skills and backgrounds to team-up and collaboratively create prototype solutions to current issues and problems in healthcare over two days. 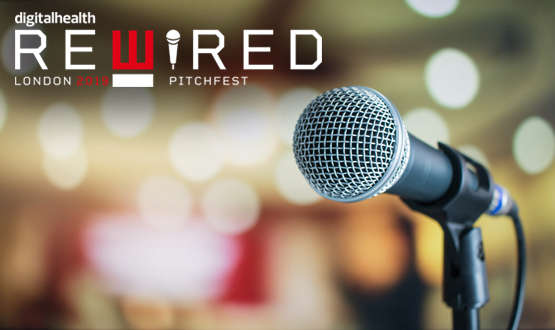 Potential Rewired Pitchfest applicants will have the opportunity to learn more about the competition and ask judges questions by registering for a Pitchfest webinar taking place on 8th February 2019 at 12:30pm-1:30pm.